It’s that time—the school holiday breaks are upon us. Time to pack up and head out for a family holiday, and Byron Bay is an excellent destination choice. We enjoy an amazing climate (temperate, even in the winter), beaches and hinterland, a huge array of restaurants and tons of activities. Byron Bay is the perfect place for a family holiday because our location has something for kids of any age range. So take a look at our ideas for things to do in Byron Bay, and book your stay now! Because you must see the famous Byron Bay Lighthouse when you holiday here, the coastal walk to the lighthouse ranks as a top activity for holiday goers. The walk takes about two hours and will offer you some magnificent views along the way. The walk is somewhat steep, but certainly manageable for the vast majority, including young kids. Besides you’ll have plenty of chances to rest when you stop to catch sight of dolphins, stingrays, turtles and sea eagles. A bonus of coming in the winter is the opportunity to look for migrating humpback whales! In fact, we don’t just suggest you look for the whales while out on your lighthouse walk. We say you should go ahead and take the family on a whale watching tour! There are many tour options, but the largest are Whale Watching Byron Bay and Blue Bay Whale Watching. Both Byron Bay activities run about two to three hours. And don’t worry, these guides want to make sure that you see a whale so most of the tours guarantee a sighting. Considering Byron Bay is the unofficial yoga capital in Australia, you and your family should really try out a class while here. While this may not interest your littles, it would be fun to do a class with your older kids who could fully appreciate and participate in a class. If you have a range of ages in your family, you could try out Beachside Yoga & Massage, so other non-yoga members of the family can hang out at Main Beach (perhaps hit up Apex Park, see below) or grab a snack at Byron Bay Surf Club. Beachside is located above the surf club and doesn’t require bookings and provides yoga mats. Drop-in classes are $20. One of the top picks of local hiking trails, Protesters Falls is not to be missed. The falls, one of the tallest in Australia, are the highlight of an easy 1.2km walk travelling from Terania Creek picnic area through beautiful bungalow palm forest to the base of the falls. Boggy Creek Walk is located in Whian Whian State Conservation Area. This easy hiking trail is 2km (one way) and winds through the rainforest between Rummery Park and Minyon Falls, making either end of the hike a good place to take a break for a snack or picnic. This playground just off the most popular beach in Byron Bay, Main Beach, is a great, free option for families. Parents will like the views of the ocean while the kids will enjoy the swing set, slides (including a tunnel one) and other equipment. If you’re looking for a chance to be at the beach, but not necessarily get into the water, this is a fun way to enjoy the scenery and let your kids blow off some steam. 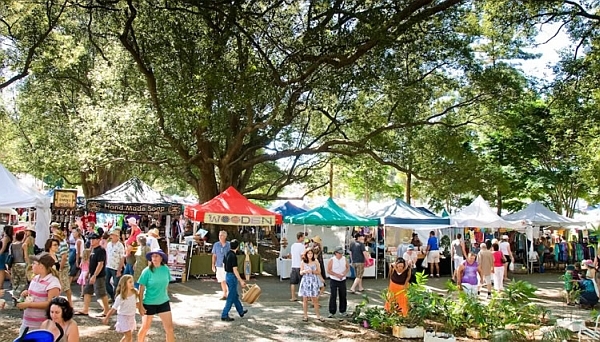 Stop by the Byron Bay Farmers Market if your school holiday visit falls on a Thursday. From 8 to 11 am, you can head to the Butler Street Reserve and you and your family can wander the stalls, checking out the fresh produce and other delicious food. The market is an excellent way to grab fresh ingredients to cook up yummy dinners back at our Byron Bay Holiday Park. If you miss the Thursday market, you can try the one in Bangalow that happens on Saturdays from 8 to 11 am behind the Bangalow Hotel. Plus, going to the market in Bangalow is a great reason to visit the rest of this quaint town that offers great shopping and other restaurants. This day trip from Byron Bay might be a really good option if you have older tweens and teens that might get into the shopping part! 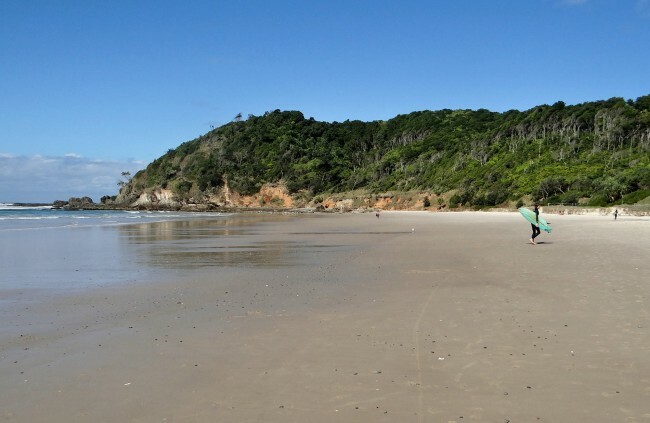 Considering it is practically on top of Broken Head Holiday Park, Broken Head Nature Reserve will give your family options for the whole day: beach, picnic area and a walking trail. The walking trail, Three Sisters, is 1.2km one way and takes about 90 minutes to complete, round trip. The view from the lookout is an excellent spot to admire the natural surroundings from the pristine ocean to the secluded beach. This location also is a good option for whale watching! The following activities are available during the 2018 school holidays. There are plenty of holiday events going on in the Byron Bay shire, so check out this calendar for a wide range of ideas. We picked out several activities to highlight that would appeal to a wide range of ages. During the school holidays, the Byron Bay Skateboard School will offer two holiday day camps. The first one is the Warehouse Day Camp (ages 7 to 12 years old), which lasts from 9am to 3pm, includes lunch and snacks and costs $80. It will feature a full day of skateboard instruction in their facility in the Byron industrial estate. The second is the Skatepark Tour (again for 7 to 12 year olds), available for all skill levels, and features a tour of the best skateparks in the area from Lennox Head to Bangalow. It goes from 9am to 5pm and costs $100. The Farm Byron Bay is offering lots of fun workshops for kids during the school holidays this year. One-day workshops are from 9:30am to 12:30pm and cost $55. These workshops have different themes including “Bees,” “Pigs,” “Flowers” and “Chickens.” Check the website for dates and for registering for the workshop, which is required. This fun activity won’t keep your kids for any length of time, but it will be a great free option for you to do with your kids during your holiday. Circus Arts Byron Bay will offer this half-hour workshop every weekday during the school holidays at 1 pm. Kids will learn to make balloon animals, flowers, swords and more. It is recommended for kids age 8 and up, or for younger kids assisted by a parent. Book tickets to watch three siblings from Byron Bay who are performing their first magician show: Yuvisun, Bob and Diamond are 14, 12, and 9. The Biggest Little Magicians, which will be at 2 pm at Brunswicks Head Picture House, presents a mix of classic and new tricks that will provide a fun afternoon outing for all ages. Ticket prices range from $10 per adult (early bird pricing now) to $28 for a family of four. Another option for fun school holiday entertainment is the Dr. Hubble’s Bubble Show at 2pm, 14 July. Remind yourself and your kids of the wonder of bubbles as Dr. Hubble (Shep Huntley, world-renowned circus and sideshow performer) will show you bubbles in all shapes and sizes, including the amazing “explode-bubble,” which might be the biggest bubble you’ll ever see. Plus, one lucky kid will get to be inside a bubble! Tickets are $15 a person or $55 for a family of four. The Lennox Head School Holiday Program runs Monday through Friday from 9 am to 5 pm. The cost is $25 for a half day and $50 for a full day. Kids will be taking part in such activities as arts and crafts, drama and games. The school holiday program is held at the Lennox Head Community Centre and is run by teachers. There will also be an afternoon-only Kidz Klub program in Byron Bay at the Byron Bay Community Centre for ages 4 1/2 to 12 years old. The cost is $25 and runs from 1:30 to 4pm, Monday, Tuesday and Wednesday (9-11 and 16-18 July) during the school holidays. If your kids love to jump, roll and just generally get the wiggles out, then these Spaghetti Circus workshops just might be what you’re looking for to entertain them for the day. For kids age 7-14, you can enroll them in one, two or three days of workshops on 17-19 July. The workshops last from 10am to 3pm and cost $60 per day or $150 for all three if you pay and book in advance. Junior workshops for 4-6 year olds also are offered from 9:30am to 12:30pm on those same days for $40 a day or $120 for all three if you pay and book in advance. Kids will rotate in the older version between mini trampoline, big trampoline, tumbling, manipulation (stilts, juggling, hoops, spinning plates, walking globe etc..), balloon twisting and aerials (trapeze, silks, lyra, cloud swing and rope). Younger kids do the following stations: tumbling, acro-balance, hula hoops, ribbons, juggling, trapeze, silks or lyra. We looked through our posts to give you a few links that will help spark ideas to pass time when you’re on your holiday. 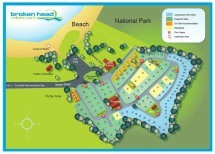 Staying at Broken Head Holiday Park will allow you to save money on your holiday accommodation and spend more on any of the above activities. We offer a special deal during the school holidays (30 June to 15 July 2018) where kids (ages 0-17) stay for free! We do require a minimum stay of three nights and have all kinds of accommodation options available from powered and non-powered sites, to beach shacks. So don’t delay and contact us to book your stay in Byron Bay before the school holidays are over!